At STP, Stop That Pest, our wasps nest removal and bees removal service is second to none. Feel free to contact us with you wasp or bee problem for a free no obligation quote. We're based in South Birmingham and operate thoughout the West Midlands. and Bees Many people confuse wasps with bees. They are very similar in only a few ways. All bees are social insects that live in our society, while only a few types of wasps do. Because wasps are black and yellow, they are often confused with bees. Nevertheless , bees are furry with considerably more robust bodies compared to wasps. Wasps are also believed to be more dangerous than bees and often thought to sting without provocations. 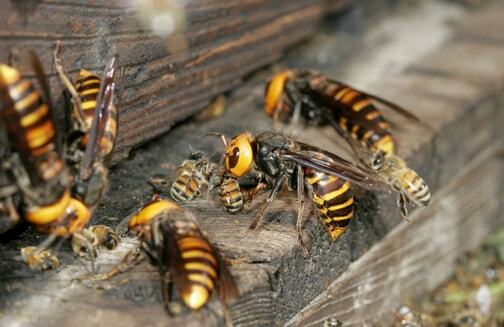 While wasps are much more aggressive than bees, they will only sting in self-defence. This could occur when a wasp feels that an animal or human is too close to their nest , which can be hard or impossible to see , making the risk of provoking a wasp greater than that of provoking a bee.